A Missouri House panel passed ethics legislation on its first day in session before Republican Governor Eric Greitens inauguration Monday. The General Laws Committee approved a ban on lobbyist gifts to legislators and statewide elected officials by an 11-1 margin. Representative Justin Alferman (R-Hermann), who sponsored the bill (HB 60), claims it effectively bans individually consumable items from being gifted to legislators. Alferman expressed frustration with several Democrats, who complained the measure was full of loopholes “you could drive a truck through”. He noted almost all of them had voted for the same legislation last year, which failed to become law. Representative Lauren Arthur (D-Kansas City) voted no after her amendment to do away with the measure’s exemptions was rejected. The exemptions in the bill are for flowers, plants, speaking fees and gifts to all 197 lawmakers. An example of gift to all lawmakers would be free food at the capitol, which Democrats raised concerns over (Free food, especially during lunch hours, is a staple at numerous state capitols). The full house is expected to consider the measure Thursday, when Arthur says she’ll reintroduce her amendment. Greitens campaigned largely on the issue of ethics reform. 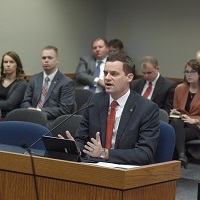 Before voting in favor of the bill, Representative Tracy McCreedy (D-Creve Coeur) complained it was being rushed through with glaring loopholes. Democrat Arthur said other members of her party probably voted to pass the gift ban because it’s better than rules in place now which don’t address the issue. House Minority Whip Kip Kendrick (D-Columbia) wants to work on the ethics bill closely with Greitens He’s filed HB 217, which bans lobbyist gifts to elected officials, and to their spouses and dependent children. It would also increase the waiting period for an outgoing lawmaker or outgoing statewide officeholder to register as a lobbyist from six months to five years. It’s not known if his legislation will have any traction in the legislature which is dominated by Republicans.